Two pretty huge changes coming up for me personally and for Harken Press in the next month. Obviously both of these have been in the works for several months now, but we just recently finalized everything so I can officially share the news. The first thing people ask when I tell them we’re moving is “Why?” Why would you leave beautiful San Diego?! Honestly, the reasons why we’re relocating to the South aren't glamorous. It’s a combination of several reasons, all could be categorized as old fashioned adulting. If you live in Southern California and have ever been so brave as to look into the real estate market, you know exactly what I mean. It’s a bit depressing once you really get into it. I could go on, but it’s just how the market is. My husband and I are at the point in our lives (in our mid thirties) where we know what we want, how we want to live, and what’s important to us. We don’t want to sacrifice a large part of our must-have list anymore. When I moved to San Diego eight years ago from Baton Rouge, Louisiana, none of this bothered me. I knew everything would be more expensive, but I also knew what I’d be gaining – 365 days of sunshine, the beach, and not to mention diverse culture! I always thought of it as a sunshine tax that I was happy to pay. And I certainly took advantage of all the free things the city has to offer – beaches, bays, parks, hiking, events, etc. I still say it was the best decision I’ve ever made. Taking the leap of faith to move across the country without connections, family or friends. The job I had lined up fell through the day before I moved. I was devastated. Do I still go? My gut said "Yes, go." Am I insane? It felt like cliff jumping. You know there’s water waiting to catch you at the bottom, but you don’t know where you’ll land. You just know the experience will be exhilarating and worth it. Worse case you’ll belly flop and it will hurt for awhile. I decided I could handle a belly flop. I could always move back to Baton Rouge and pick up where I left off. Luckily for me, I quickly made some amazing friends and found a job where I met my now husband. A few years later we got married and have a 2 year old daughter and another on the way. In hindsight I can see it was all part of a master plan. Living in San Diego for eight years now, my life looks a bit different. Actually, a lot different. Having small children changes your lifestyle and your priorities. I’m not concerned with the latest wine bar or tapas restaurant opening downtown, I’m researching potty training strategies and looking for sales on double strollers. It’s a new chapter and I realized things like no income tax, more square footage, good public schools, groceries at half the cost, and a dishwasher would be pretty nice in this new chapter. That’s right, we currently don’t have a dishwasher. Now I'm taking a new leap of faith. There's so much I'll miss about San Diego and all the wonderful friends we have here. It's bittersweet, but I know this is the right next move for my family and my business. All of this ties into the fact that our family is growing!! We’re expecting a baby girl in April. Yay! Another benefit of moving is that my Mom will be very close to our new place and I can’t tell you how nice it will be to have someone close by to help. I dealt with postpartum depression and anxiety with my first baby and part of the problem was not asking for help when I really needed it. I know it will be different this time around, I’ve learned so much and I know what to expect this time. Every baby and birth is different, but I feel so much more prepared and calm. I’m going to give myself more grace and understanding in those first few months. But dear God, please let this baby be a good sleeper! A mother can hope. My motto lately has been “one day at a time”. My to-do list is long and I’m low on energy. I just got to the point where I’m slowing down in the third trimester. Running after a toddler and running a business leaves me feeling pretty wiped out at the end of the day. But all the excitement is pushing me forward. Meeting my new baby. Discovering a new city. Buying our first house and making it a home exactly the way we want it. Lots going on and lots to be thankful for. Thanks for all your support during this transitional time. Photos by the amazing Katherine Beth Photography. Somehow she managed to get my daughter to genuinely smile. 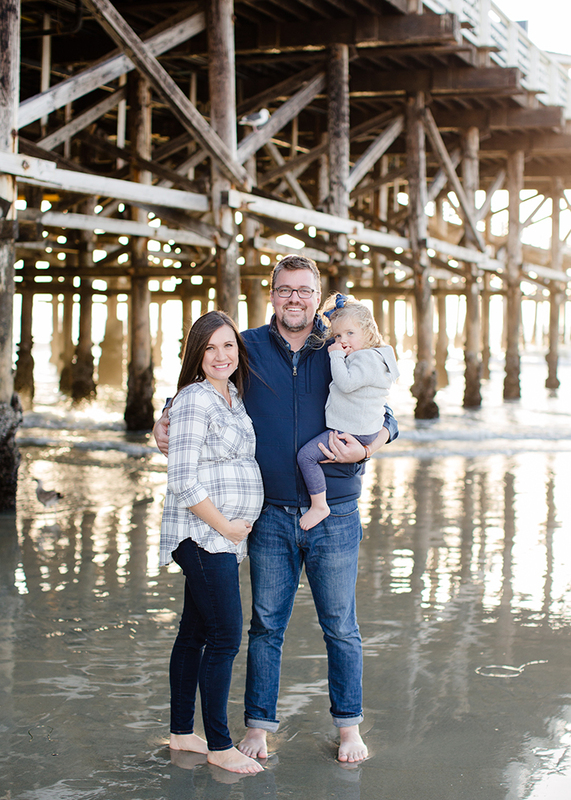 I’m so happy we have some family photos at one of my favorite beach spots before we move.